The first of the pieces reminds of the Swedish folksong Little Spider climbs the wall It is all great fun, also the Ouverture based on the American national anthem. Just hear the wonderful songlike second theme in track 2. well, worth the whole disc. Even Gade comes to mind. Hägg is a tragic case. 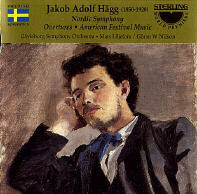 He started off as one of the most promising Swedish composer talents of all times. But it came to a standstill. He seemed unable to take in more modern style in his compositions. The symphony is a significant in this respect. It just stays being a well written Schumann symphony.